The following provides general questions and answers (Q&A) regarding a furlough. https://www.opm.gov/policy-data-oversight/pay-leave/furlough-guidance/. Please also check OPM's website for the most up-to-date guidance on general matters. Q. Are there any major changes related to the shutdown? A. The most overarching change relates to travel. Please note the following guidance which applies to both “excepted” and “exempt” staff. Note: All in-country travel is exempt from this process. Q. What is a furlough? A. A furlough is the placing of an employee in a temporary non-duty, non-pay status because of lack of work or funds, or other non-disciplinary reasons. Q. What is a shutdown furlough and why is a shutdown furlough necessary? A. In the event that funds are not available through an appropriations law or continuing resolution, a "shutdown" furlough occurs. A shutdown furlough is necessary when an agency no longer has the necessary funds to operate and must shut down those activities that are not “excepted” pursuant to the Antideficiency Act. Q. Can “non-furloughed” employees perform other than “excepted” work? The Agency “excepted” some employees from furlough who are performing necessary contract or grant support functions for an "excepted" activity or under the "necessary implication" standard. Can these employees also continue to perform other work (that is not for an “excepted” activity and is not "necessarily implied") during the remaining hours of the workday? A. If the “non-furlough” ("excepted”) support function can be performed in less than an entire day, the employee is required to resume furlough status after completing the function. However, there may be cases in which an employee is required to perform this "excepted" support function intermittently throughout the course of the day, and the intervals in between are too short to enable the employee to be “furloughed” and then recalled in time to perform the function. In such cases, the employee may remain at work and may perform “non-excepted" functions during these intervals. In such situations, agencies must minimize the number of employees who are performing "excepted" functions on an intermittent basis by consolidating the "excepted" functions, to the extent possible, for performance by a smaller number of employees (e.g., agencies should not “except” from furlough multiple employees in order to perform intermittent "excepted" work, when instead the agency could have fewer employees perform the "excepted" work on more of a full-time basis). In this way, the agency properly minimizes its reliance on the Antideficiency Act to incur obligations for which the appropriation has lapsed. Q. What is the difference between “Excepted” functions and “Exempt” functions? A. "Excepted" functions are those activities that would otherwise be funded by FY 2019 appropriations (mainly referring to OE-funded activities and positions) but that may be continued despite a lapse in appropriations because statutory authority exists to allow such activities to continue (i.e., that such activities are necessary to protect life or safeguard government property and records, to conduct foreign relations essential to national security, to carry out the orderly shutdown of operations, or to provide essential administrative support to “excepted” employees). “Exempt” functions are those activities that can continue during a shutdown because sufficient funding (mostly referring to multi-year appropriations or funding from other non-OE accounts) is still available and as a legal matter are not impacted by the lapse of appropriations. Q. How will I know if I'm occupying an "excepted" or “non-excepted” position? Q. How do I know if I am “exempt” from the lapse in appropriation? A. Your supervisor, AMS officer, or EXO should have notified personnel if they are funded by a source that has not lapsed and thus they are exempt and continue to perform their normal duties. In such instances, no determination of “excepted” versus “non-excepted” activities is required. Q. If I am an “Excepted” individual during the Lapse, can I work on “Exempt” or “Non-Excepted” Functions? Q. If I am an “Exempt” individual, can I work on “Exempt,” “Excepted,” and “Non-Excepted” functions during the Lapse? A. Generally, yes. An individual should check with their RLO/GC point of contact on questions related to this area. Q. Are individuals appointed by the President subject to furlough? A. According to OPM, individuals appointed by the President, with or without Senate confirmation, who otherwise are not subject to 5 U.S.C. 6301 and attendant regulations governing leave in the Federal service, are not subject to furlough. The salary of such a Presidential appointee is an obligation incurred by the year, without consideration of hours of duty required. Thus, the Presidential appointee cannot be placed in a nonduty, nonpay status. If a Presidential appointee, however, chooses to be in a nonpay status, he may return part of his salary to his employing agency, provided that the agency has authority to accept gifts, or to the Treasury. Regardless of the Presidential appointee's choice, his entire salary is recorded for tax purposes. The following exception must be noted: former career Senior Executive Service (SES) appointees who took appointments at level V of the Executive Schedule or higher and elected to retain SES leave benefits under 5 U.S.C. 3392(c) are subject to furlough at the discretion of the agency. Q. Are Administratively Determined appointments subject to furlough? A. Personnel who are under Administratively Determined appointments are subject to furlough and should check with their respective AMS. Q. How are Appointment Eligible Family Members (AEFMs) handled? A. Post should determine if AEFMs are “excepted” employees and treat them as they do Foreign Service personnel. For EFMs under Personal Services Contracts, please refer to Section VIII of the Guidance on USAID Operations during a Lapse in Appropriations. A. Application of the furlough to Locally Employed Staff (including foreign nationals and locally resident U.S. citizens paid under the local compensation plan, whether, in either case, on PSCs or direct-hire appointments) depends on local labor laws in each country. In general, LE Staff will be required either: a) to report to work as directed by their supervisor (i.e., if “excepted,” or if treated as “excepted” because these LE Staff legally must be paid, provided that in no event may LE staff report to work if adequate supervision is unavailable); b) to be on excused absence leave per 3 FAM 7451, if LE Staff must be paid under local labor law but may not actually work because, for example, adequate supervision is not available; or c) to be placed on ordinary furlough status. Human Resource Offices at each post will examine local labor law and make appropriate, post-specific determinations in conjunction with post management and in consultation with the RLO. Q. Are unpaid interns allowed to come to work? A. Unpaid interns are allowed to come to work if there is work to be performed and sufficient supervision provided by an employee filling an “excepted” position. No position will be determined to be “excepted” solely for the purpose of providing supervision to unpaid interns. Q. Are Presidential Management Fellows (PMFs), Pathways Program participants, and Recent Graduate Program (RGP) participants considered "excepted"? A. PMFs, Pathways, and RGPs participants may be determined to be “excepted” employees using the same standard applied to other Agency employees. Those whose functions are not determined to be “excepted” will be “furloughed” and should remain in place until further notice. Q. I am on detail from (or to) another federal agency; am I considered “excepted”? A. If you are detailed from (or to) USAID to (or from) another federal agency and are performing “excepted” functions in your current position, you are likely “excepted.” However, you should also coordinate with your home agency – particularly if your position is funded by that agency and/or you are not “excepted” in your current position – in case you are needed to perform “excepted” functions there. For details involving non-Federal agencies, refer to OPM guidance, Section C.
Q. I work under a PASA arrangement with USAID. Am I considered “excepted”? A. PASA employees must coordinate with their home agency, in consultation with their current Operating Unit, to determine their status. Q. I am an American working under a PSC for USAID. Am I considered “excepted”? A. PSCs may continue to work as long as sufficient funds are obligated to their contracts, and there is adequate supervision over the work. Note that leave for such PSCs remain governed by the terms of the PSC contract. Temporary work stoppages of PSCs are accomplished through a partial termination for the convenience of the Government. A termination for convenience requires a minimum notice of 15 calendar days before it is effective. Contracting Officers must notify PSCs of the partial termination of their contracts 15 days before funding will be exhausted under their award. Q. Are all employees who qualify as "emergency employees" for the purpose of weather emergencies considered to be "excepted employees" for the purpose of a shutdown furlough? A. Not necessarily. "Emergency employees" are those employees who must report for work in emergency situations, e.g., severe weather conditions, air pollution, power failures, interruption of public transportation, and other situations in which significant numbers of employees are prevented from reporting for work or which require agencies to close all or part of their activities. Emergency employees are not automatically deemed “excepted” employees for purposes of shutdown furloughs. Each agency must determine which emergency employees are “excepted”. Q. Can changes be made to the list of “excepted” positions once the furlough has begun? A. Yes. It is understood that special requirements might necessitate bringing an employee back from furlough for a limited period of time. The employee can be called in to perform the “excepted” function and then can be placed back in furlough status when the assignment is completed. Alternatively, operating units may rotate staff to encumber “excepted” positions as deemed appropriate and in accordance with the detailed answer below on rotations. Bureaus/posts must keep careful records of these changes. Q. Will overseas positions be affected as heavily as domestic positions? If not, won't the furlough affect the Civil Service in disproportionate numbers? A. All overseas posts have been requested to provide contingency plans in case of a furlough. USAID Principal Officers abroad should coordinate with the Chief of Mission in developing such plans. The criteria for identifying an “excepted” position is the same as in the domestic offices. Q. Can posts rotate who is considered “excepted” and who should report to work on a given day? Managers should take into account the potential impact on unemployment compensation eligibility for the employee, based on local jurisdictions’ unemployment insurance policies. Decisions on rotations for specific positions should balance the Agency's need for continuity and equity to the employees. Posts may determine on what basis rotations may take place (based on increments of at least one week) but due consideration should be given to continuity and fairness. Personnel rotated into and out of an “excepted” function must have the requisite qualifications to perform the function. All decisions to rotate employees must be documented by the B/IO or post. Q. How do I manage the rotation of employees during an absence of appropriations? A. If a rotation is deemed appropriate or necessary, time and attendance (T&A) must be carefully tracked to reflect each employee's status. Q. What is the proper procedure for shutdown? A. USAID will notify direct hire employees (Foreign Service - including Foreign Service Limited staff, Civil Service, and Foreign Service Nationals) of a shutdown when it receives official notification from OMB. Employees will be given their furlough notices and instructed to proceed with orderly suspension of operations. It is expected that the shutdown activities will not take more than four hours. Therefore, it is possible that some employees may leave earlier than others. Each employee/supervisor should note when an employee has left for T&A purposes. For purposes of communicating work status to “non-excepted” employees, supervisors should have employee personal contact information on file. Q. Isn't the Agency required to provide me with 30 days advance written notice before they can furlough me? A. No. The usual 30 calendar days advance notice was not possible due to the emergency requiring curtailment of Agency operations. Q. Will I be notified by the Agency when the furlough is over and when I must report back to work? A. All employees are advised to listen to the news and check USAID’s webpage and OPM’s webpage to find out whether another continuing resolution or an appropriations bill has been enacted. As soon as you hear that the furlough has ended, you should report back to duty on the next workday, or the next duty day, unless otherwise directed by your office. Overseas posts will be notified by cable that the furlough has ended. Employees may also monitor OPM’s website for operating status. Q. Will “excepted” employees be paid for performing work during a shutdown furlough? If so, when will “excepted” employees receive such payments? A. Agencies will incur obligations to pay for services performed by “excepted” employees during a lapse in appropriations, and those employees will be paid when Congress passes and the President signs a new appropriation or continuing resolution. Q. Will employees who are “furloughed” get paid? A. On January 16, 2019, the President signed into law the Government Employee Fair Treatment Act of 2019 providing for back pay of “furloughed” and “excepted” employees. Additional guidance on back pay will be posted once provided by OPM. Q. May an employee volunteer to work or telework on a non-pay basis during a shutdown furlough? A. No. Unless otherwise authorized by law, an agency may not accept the voluntary services of an employee. (See 31 U.S.C. 1342.) Employees are prohibited from working during a furlough unless they occupy an "excepted" position. A “furloughed” employee may not use a fob or other Agency-issued mobile device to perform work or otherwise "telework" from home while “furloughed.” “Non-excepted” employees should turn off all Agency-provided mobile devices. Q. May an employee take other jobs while on furlough? A. While on furlough, an individual remains an employee of the Federal Government. Therefore, executive branch-wide standards of ethical conduct and rules regarding outside employment continue to apply when an individual is “furloughed” (specifically, the Standards of Ethical Conduct for Executive Branch Employees at at 5 C.F.R. Part 2635). USAID employees based in the United States need to seek approval for outside employment only if the employment could pose a conflict of interest with the employee’s USAID position by emailing Shutdown_info@usaid.gov. Uniform/Foreign Service rules governing employment abroad are contained in 3 FAM 4123 and 3 FAM 4126. Individuals overseas seeking employment must consult with your respective RLO. All overseas employees engaged in outside employment must report that outside employment to SEC at secreporting@usaid.gov and obtain Chief of Mission approval, as appropriate. A. As emergencies arise, your duties may be determined to have changed from “non-excepted” to “excepted.” You will be notified if your status changes and you need to resume work. Similarly, if a current crisis situation improves, certain functions which are currently “excepted” may become “non-excepted” and the affected employees “furloughed.” For purposes of communicating work status to “non-excepted” employees, supervisors should have employee personal contact information on file. Q. If someone is declared “non-excepted” but cannot be reached for notification, i.e., someone on vacation, what is the employee’s status? A. Any employee who is not working in an “excepted” position will be placed on furlough regardless of whether he/she has received formal notification. Every practicable effort should be made to contact the employee, but if that is not possible, then the employee should receive official notification of the furlough upon his or her return to duty. Q. May post hire personnel during the lapse in appropriations? A. No, with the exception of recruitment related to “excepted” or “exempted” positions/functions where (a) funding is available and (b) sufficient administrative/processing resources, e.g., RSO, HR, are operational. Q. Why have I not received a furlough notice yet? A. There are many reasons you did not receive a furlough notice, including, for example, that you are an exempt employee and are not “furloughed.” You should contact your Bureau/Independent Office’s AMS officer or EXO at post for information about your specific situation. Q. If the government shuts down, do I need to report to work? A. In the event of a lapse of appropriations, employees are expected to report to work as usual on their next scheduled work day unless they hear otherwise from their supervisors. As a national security agency, USAID will conduct an orderly shutdown. Those who are “furloughed” should organize their work to be passed on, set out-of-office messages on their e-mail and phones, and brief “excepted” individuals on key “excepted” issues. We expect those “non-excepted” employees who come to work to be paid for up to 4 hours. If you are teleworking, you should check in as usual. If you are a non-excepted employee your supervisor will send you an e-mail notification of furlough and you should prepare to shut down your work, sending information of work in process to your supervisor. You will be credited with up to 4 hours of work. Q. What if I am on an Alternative Work Schedule (AWS) and the next scheduled work day after appropriations has lapsed is my Regular Day Off (RDO)? Q. Will the assignments process be disrupted by a furlough? A. Yes. Personnel actions will be processed only for emergency situations. All others will be delayed until staff return from furlough and are able to catch up on other assignment actions. Q. What is the status of the Major Listings and the Senior Leadership Group assignments? A. No assignments will be announced during the shutdown period. Q. What is the status of the assignments under Update One? A. Foreign Service Assignments Update One is postponed. New dates will be announced after USAID returns to normal operations. Q. Is the Exceptions Committee processing any requests? A. No Exceptions Committee requests will be reviewed during the shutdown period. Urgent requests should be sent to both the FSC Director Rory Donohoe (rdonohoe@usaid.gov) and Deputy Director Dinah Zeltser (dzeltser@usaid.gov). Q. What about EODs scheduled to take place the next day after a lapse in appropriations? A. If an employee is transferring from another agency, they may enter on duty and then be “furloughed” or begin work if their function is designated “excepted.” The same rule applies to EFMs whose employment is governed by Executive Order. Q. Where do I find the list of fund accounts for which funding has lapsed? Q. I am a USDH employee subject to a lapse in appropriation AND am performing “excepted” functions/duties. Can I travel once the lapse has started? A. Maybe, if it meets the below guidance. Only official travel in fulfillment of “excepted” activities can be initiated after a lapse of appropriations, regardless of whether or not the employee had a funded and approved travel order authorization to the lapse in appropriation. Travel should be limited to that necessary for emergencies involving the safety of human life or the protection of property, or that necessary for the conduct of foreign affairs essential to national security. This may include, but is not limited to, attending significant bilateral or multilateral meetings; maintaining “excepted” post operations; disaster relief efforts, emergency visitation, medical, other ordered evacuation; or providing food, medicine, or other essential services to displaced persons. All travel authorizations must be approved by the Bureau or Independent Office Head or the Mission Director and notification of the approval sent to the maataskermaillist@usaid.gov. Travel for Training - Participation in some training activities may be considered an “excepted” activity, so the travel to the “excepted” training event should follow the same guidance as outlined above. A list of the training activities that may be considered “excepted” please see the Training for USDH section of the Guidance for USAID Operations During a Lapse in Appropriation. GC or RLO can provide additional guidance. Travel for R&R and Education are addressed in FAQs below. Q. Can I travel to post under my Permanent Change of Duty Station orders? A. Reassignment of personnel already planned may be continued, such as changes in posts of assignments, only if funds were obligated prior to the lapse in appropriation. Any exceptions to this policy must be approved by the Director of the Foreign Service Center, in consultation with the Office of the General Counsel. Such travel on or after January 11, 2019, must be approved by the Bureau or Independent Office head or the Mission Director before it commences and a copy of the approval must be sent to maataskermaillist@usaid.gov. All approval documentation must be uploaded into E2 and attached to the travel authorization. Q. Can I go on Home Leave as part of a Permanent Change of Duty Station or as Home Leave Return to Post? A. Yes. Home leave is both a type of travel and a category of leave. Home leave travel is approved only if funds were obligated prior to the lapse in appropriation and if post does not need the employee to remain at post to perform an “excepted” function. The FSO will be “furloughed” upon departure from post and no time would be charged to Home Leave. However, travel on or after January 11, 2019, must be approved by the Bureau or Independent Office head or the Mission Director before it commences with copy of the approval sent to maataskermaillist@usaid.gov. All approval documentation must be uploaded into E2 attached to the travel authorization. Once USAID returns to normal operations, affected FSOs should reach out to the Foreign Service Center via the Exceptions Committee mailbox to review their situation and determine if a Home Leave Waiver is necessary. Q. Is Educational Travel allowed during a shutdown? A. Education travel is allowed only if funds were obligated prior to the lapse in appropriation or if necessary for human safety (e.g. if the school closes for a holiday and the student must vacate the dorm). Travel on or after January 11, 2019, must be approved by the Bureau or Independent Office head or the Mission Director before it commences and a copy of the approval must be sent to maataskermaillist@usaid.gov. All approval documentation must be uploaded into E2 attached to the travel authorization. Q. Because educational travel is not allowed as a new obligation, will I be reimbursed for purchasing my child’s airfare? A. Reimbursement for any expenses incurred by an employee while under a lapse in appropriation cannot be guaranteed. Once the lapse is over, a request may be made and it will be considered under the terms of any subsequent legislation that is passed that closes the lapse of funding. Q. How is a Medical Evacuation (MEDEVAC) treated under the shutdown? A. If the concurrence of Department of State Office of Medical Services (MED) is received, emergency medical travel and services obligations can be incurred, but may not be recorded in Phoenix until the shutdown has ended. In such instances, post must maintain manual documentation of the obligation for later recording in Phoenix. In the event that MED requests a “fund cite,” contact shutdown_info@usaid.gov for guidance. Payments for emergency health services may be made in consultation with the Regional Controller, M/MPBP, and MCFO. Please coordinate with MED and follow their guidance in emergency situations where payment is required immediately. For medical services funding requests, the post should cable MED and coordinate with its Regional Controller, who will address the situation with M/MPBP and M/CFO. Once an employee is in MEDEVAC status or any other situation that would otherwise be charged sick leave, that employee will be in furlough status for the duration of the shutdown. Q. If employees are out on Rest & Recuperation (R&R) at the time of the start of the furlough, should they return to post before the furlough begins? A. No, they may complete their R&R (in a non-pay status) and when they return to Post, management should determine whether they are “excepted” or not. If they are not, they should be given a furlough letter. Employees who return to Post earlier than scheduled to perform “excepted” work will not be eligible for an additional R&R to replace the shortened trip. Q. I was on R&R leave at the time of the shutdown. Can I return to post? A. If an FSO is currently on R&R, he/she may return to post. Q. I am scheduled to go on R&R leave while under the shutdown. Can I proceed with my travel? A. You can proceed with R&R travel only if funds were obligated prior to the lapse in appropriation. However, travel on or after January 11, 2019 must be approved by the Bureau or Independent Office head or the Mission Director before it commences and a copy of the approval must be sent to maataskermaillist@usaid.gov. All approval documentation must be uploaded into E2 attached to the travel authorization. Q. I am an employee performing “excepted” duties, but I need to be away from my duties. What do I do? A. If an “excepted” employee needs to be excused from duty, the employee must be “furloughed.” Check with your AMS officer or EXO on who to notify when you need be excused from duty as the supervisor may need to consider using the rotation of personnel. Q. I am a USDH employee subject to a lapse in appropriation AND I am in travel status when the lapse started AND I am NOT performing “excepted” duties. What do I do? Q. I am a USDH employee subject to a lapse in appropriation AND I am in travel status when the lapse started AND I am performing “excepted” duties. What do I do? A. Personnel in domestic or overseas travel status who are performing “excepted” functions may continue to do so. Q. I am a USDH employee subject to a lapse in appropriation AND I am “furloughed.” However, I have a TDY that was funded and approved before the lapse started. Can I travel? A. No. If you are “furloughed,” then you are not performing “excepted” functions/duties. Thus, all travel related to your duties would be canceled/postponed until the lapse is over. Q. I am a USDH who is EXEMPT from the lapse in appropriation. Can I travel? A. Yes, you can travel. However, travel on or after January 11, 2019 must be approved by the Bureau or Independent Office head or the Mission Director before it commences and a copy of the approval must be sent to maataskermaillist@usaid.gov. All approval documentation must be uploaded into E2 attached to the travel authorization. Q. I am a USPSC. Can I travel? Q. I am a CCN (FSN) PSC. Can I travel? Q. Why are blanket travel orders (also known as Open Authorizations) issued prior to December 22, 2018, not valid during the lapse period, unless in the case of overseas travel, travel commenced prior to the shutdown? A. The Guidance on USAID Operations During a Lapse in Appropriation, Chapter 2, Section X. Obligations and Disbursements has been updated. Open Authorizations (OA) are defined as a "blanket order" for one individual with a preapproved request and obligation to travel at a future date, limited to: (a) specific time periods, (b) locations, (c) outside CONUS, and (d) maximum cost. OA’s can cover trips for up to one fiscal year. If the OA has sufficient funding that was obligated prior to December 22, 2018, and the travel is required to perform an “excepted” activity, then the OA may be used. Q. My Assistant Administrator, Independent Office Head or Mission Director has approved me to travel in fulfillment of an “excepted” activity. How do I get money to process the TA? A. During a lapse in appropriations, USAID has legal authority to incur obligations to continue “excepted” activities. Only travel in fulfillment of “excepted” activities can be initiated after a lapse of appropriations. In cases of travel in this category, obligations made after December 21, 2018, funded by a lapsed appropriation should not be recorded in USAID accounting systems even though obligations may have been incurred. Justification and value of the obligation should be coordinated with the shutdown_info@usaid.gov, maataskermaillist@usaid.gov, and the CFO. All obligations funded and issued during the lapse period must be approved by the Mission Director, Assistant Administrator or Independent Office Director for each respective operating unit and the following statement shall be affixed and signed by the Mission Director, Assistant Administrator or Independent Office Director, as applicable: "This obligation is necessary to carry out “excepted” activities in the absence of an appropriation or to perform activities for which funds are otherwise available." Justification and value of the obligation should be coordinated with the shutdown_info@usaid.gov and the CFO. Q. What training can be attended while under a shutdown? Does it matter if I am in an “excepted” function as to whether I can attend? A. Participation in some training activities may be considered an “excepted” activity. Employees in “excepted” functions cannot attend training that has not also been determined to be “excepted.” Travel to the “excepted” training event should follow the same guidance as outlined in the guidance. For a list of the training activities that may be considered “excepted”, please see the Training for USDH section of the Guidance for USAID Operations During a Lapse in Appropriation. Generally, all HCTM-sponsored training is canceled until funding is resumed. As such, training and travel to training may be impacted, even for “excepted” and exempted employees (e.g., FEI, WLC, Management Concepts, and other entities that serve federal employees). Please confirm the availability of training prior to traveling. GC or RLO can provide additional guidance. Q. Are vouchers being processed during the shutdown? A. Payment processing is not an “excepted” activity in and of itself. However, payment staff (particularly overseas) and AORs/CORs in an “excepted” status may continue to provide approvals and process payments either as an “excepted” activity or as an intermittent activity. If the employee needed to perform the necessary action to process the voucher has not been designated as “excepted,” then if the contract or agreement is for an “excepted” activity, USAID can recall the “furloughed” employee to perform the necessary functions as an “excepted” activity. If the contract or agreement is not for an “excepted” activity and no “excepted” staff is available to perform the function as an intermittent activity, then the processing may need to wait until the shutdown ends. Q. How will Time and Attendance (T&A) be tracked during a furlough? A. Employees and supervisors are responsible for carefully tracking the work hours or “furloughed” hours of all employees. T&A records will have a furlough code (FR) for this purpose. Employees can continue to track hours in WebTA but MUST NOT validate or certify time until instructed by the Agency. Q. How should hours worked by “excepted” employees during the furlough be reported? A. Hours worked by “excepted” employees should be reported in WebTA as regular duty hours. If an “excepted” employee is unable to work during the furlough period, he or she must be placed in a furlough status until such time as the employee reports for work. Time cards should not be validated or certified until the agency has directed the “excepted” employees to do so. Q. How should furlough time for “non-excepted” employees be reported? A. Absences resulting from the furlough of “non-excepted” employees should be reported in WebTA as “Furlough.” This transaction code is found under the dropdown menu under “Annual Leave.” Time cards should not be validated or certified until instructed by the Agency. Q. Can annual leave, sick leave, or earned compensatory time off be charged during a furlough? A. No. Furloughs place employees in a non-pay, non-duty status. Employees may not be carried in a paid leave status during the furlough period. Q. If an employee was on approved leave without pay (LWOP) during the furlough, would LWOP continue? A. Yes. LWOP will continue and should be reported as LWOP for time and attendance purposes. Q. What are the procedures for recording time and attendance for PP 26 (December 23, 2018 – January 5, 2019)? A. “Exempt” employees (e.g., multi-year or no-year funded positions) - Follow normal processing procedures for PP 26. These timecards will be processed (by the M/CFO/Payroll Division) and forwarded to NFC for salary payment. PSCs - For those PSC positions that have been funded through this period, normal processing procedures for PP 26 should be followed. These timecards will be processed (by the M/CFO/CMP Division) and forwarded to NFC for payment. “Excepted” employees - All personnel who performed or are now performing “excepted” activities, as approved, should record their regular duty hours and their furlough hours, if any, in WebTA as follows; however, do not validate or certify any time and attendance information for PP26 until directed to do so. In the Leave Time area of the timecard, RECORD all other time for the work day as 74-Furlough. NOTE: You may need to add the 74-Furlough transaction code by clicking on the "Add Leave Time" then select 74-Furlough and click on Save. Check the time card to ensure that the TOTAL column equals 80 hours. Click on "UPDATE" - DO NOT CLICK ON VALIDATE. “Excepted” employees do not need to record any premium pay or allowances at this time. “Furloughed” employees - Do not submit any time and attendance information for PP 26 until instructed. Timekeepers should NOT transmit, send, or advance any U.S. Direct Hire, including OE-funded FSLs and program-funded FSLs initially paid from the OE account, time for PP 26 until directed to do so. As we continue to monitor the partial Government shutdown, additional guidance is being developed for complete T&A data entry and submission to ensure that hours submitted are appropriate for each individual and their respective funding status during the lapse in appropriations. The National Finance Center (NFC) successfully processed payroll for PP 25, 2018. Note that the COM governs guidance and processes for FSN time and attendance. Q. What are the procedures for 2019/PP 01? A. Please follow the same guidance above for PP26. Q. Will my use-or-lose leave be restored? A. For the shutdown that began on December 22, 2018, as long as leave was properly scheduled in advance (i.e., scheduled in writing via WebTA no later than November 24, 2018, in accordance with 5 CFR 630.308(a) and ADS 480), any annual leave that was forfeited because of the lapse in appropriations—regardless of whether the affected employees were “furloughed” or “excepted” from the furlough -- will be restored. Any previously restored annual leave that was due to expire at the end of the 2018 leave year under 5 CFR 630.306 or 630.309, and was subsequently forfeited, may not be restored again—even if the forfeiture was due to the lapse in appropriations. Q. What are the procedures for holidays? Q. How will notification be provided? What happens if I am on paid leave and cannot come to the office or Mission to receive notification? A. Notification will be provided via telephone, email, letter or general notice, along with a link to the Agency-wide guidance. In any event, such employees will be considered to be in a “furloughed” status. Q. If an employee properly schedules “use-or-lose” annual leave but is unable to use some or all of the scheduled leave because of a furlough, does the furlough constitute an exigency of the public business that would permit the restoration of leave? A. As long as leave was properly scheduled in advance (i.e., scheduled in writing via WebTAno later than November 24, 2018, in accordance with 5 CFR 630.308(a) and ADS 480), any annual leave that was forfeited because of the lapse in appropriations—regardless of whether the affected employees were “furloughed” or “excepted” from the furlough -- will be restored. Any previously restored annual leave that was due to expire at the end of the 2018 leave year under 5 CFR 630.306 or 630.309, and was subsequently forfeited, may not be restored again—even if the forfeiture was due to the lapse in appropriations. Q. If an employee is on leave under the Family and Medical Leave Act of 1993 (FMLA) during furlough days, do the furlough days count towards the 12- week entitlement to FMLA leave? A. An employee who is on approved Leave Without Pay (LWOP) under the FMLA on days that coincide with the period of furlough will continue to be charged LWOP. Consistent with law and regulations, the LWOP taken under the FMLA is part of the 12-week entitlement. However, an employee who was scheduled during the furlough to take paid leave under the FMLA (i.e., an employee chooses to substitute annual leave or sick leave, as appropriate, for unpaid leave under the FMLA) must be placed on furlough instead. Since the paid leave was canceled, the period of absence may not be used to reduce the 12-week entitlement to FMLA leave. Q. Are employees entitled to unemployment compensation while on furlough? Q. Where do I get unemployment information? The U.S. Department of Labor (DOL) has provided the additional UI guidance below for employees and agencies. Q. Is staff care available? For urgent overseas issues requiring a U.S. Direct Hire in Staff Care, please contact 202-368-0592. Q. What happens to allowances during the furlough period? Subsistence Expense Allowance (paid in the event of an evacuation). B. Allowances for eligible persons in exempt positions will continue to be provided and paid during the lapse in appropriations, assuming adequate funding is available. C. Allowances for persons in “excepted” positions will generally continue, except for Representation Allowances, which will not be paid, and as stated in C, below. Educational Travel will be provided only if it was obligated and approved prior to the lapse in funding or if it is necessary for human safety, e.g., if the school closes for a holiday and the students must vacate the dorm. *The Agency, in coordination with the Department of State, is examining the text of the recently enacted Government Employee Fair Treatment Act of 2019, which provides for back pay, to determine if retroactive payment of allowances is payable. Q. Is a furlough considered to be a break in service? A. No, it means the employee is in a nonpay, nonduty status for those days/hours. However, extended furlough may affect the calculation of creditable service for certain purposes. Q. What effect will a furlough have on other benefits that are paid for through payroll deductions? A. The effect of a furlough on benefits that are paid for through payroll deductions varies. For additional information, see OPM’s fact sheet on the "Effect of Extended Leave Without Pay (or Other Nonpay Status) on Federal Benefits and programs at http://www.opm.gov/oca/leave/HTML/LWOP_eff.asp. Q. What effect will the furlough have on payroll allotments? A. Any required withholdings (i.e., Federal and State taxes and Social Security) are based upon a percentage of actual earnings. Therefore, if an employee is “furloughed,” his or her withholdings would be reduced in turn. The employee's specific allotments would not change (e.g., credit union loans and others), unless the employee completes a new allotment request increasing or decreasing the amount withheld. Q. How will a furlough affect my contributions to my health and life insurance plans? Does my coverage continue? A. FEHB premiums are deducted from the employee's pay. If the employee's pay is insufficient to cover the FEHB premium, he or she can pay the premium directly to the agency or have it withheld from pay when he or she returns to regular duty. The enrollment continues for up to 365 days of nonpay status. The nonpay status may be a continuous period or it may include an employee's return(s) to pay status for a period(s) of less than 4 consecutive months. FEGLI coverage continues, and contributions made by the employee and the employee's agency continue if the employee's salary in each pay period is sufficient to cover deductions. If the employee's salary is insufficient to cover his or her withholding, the employee's coverage will continue for up to 12 months without cost to the employee or the employee's agency. Embassy issued and managed contracts and coverage will continue. Q. Will an employee continue to be covered under the Federal Employee Health Benefits (FEHB) program during a shutdown furlough if the agency is unable to make its premium payments on time? A. Yes, the employee’s FEHB coverage will continue even if an agency does not make the premium payments on time. Since the employee will be in a non-pay status, the enrollee share of the FEHB premium and be withheld from pay upon return to pay status. Q. If employees are injured while on furlough or LWOP, are they eligible for workers' compensation? A. No, workers' compensation is paid to employees only if they are injured while performing their duties. Employees on furlough or LWOP are not in a duty status. Q. If there is a shutdown furlough, how does this impact a separating employee’s lump-sum payment for their unused annual leave? A. In the event of a shutdown furlough, any payments incurred by the agency for an employee’s lump-sum payment will be delayed until funds are available. Q. How are separated employees’ entitlements to severance pay affected by a shutdown furlough? A. Funds for severance pay are obligated on a day-to-day basis as the recipient accrues continuing entitlement to severance pay by not being re-employed by the Government of the United States. (Severance pay is suspended or terminated when the individual is re-employed by the Federal Government.) Severance pay is paid at the same pay period intervals as if the recipient were still employed. Any severance payment (on a payroll payday) is linked to the corresponding pay period during which the recipient accrued continuing entitlement to severance pay. If the recipient is reemployed by the Federal Government during a pay period, he or she is entitled to a prorated severance payment covering the days in the period prior to reemployment (e.g., 2/5 of one week’s pay if the recipient was reemployed on the third workday of the pay period). Thus, in the case of a shutdown furlough, accrued but unpaid severance pay represents an obligation to be paid from funds available before the lapse in appropriations occurred. Just as payroll checks for work performed prior to a lapse in appropriations can be processed as part of the orderly suspension of “non-excepted” activities, severance pay checks covering days before the lapse may also be processed. No funds may be authorized for severance payments for days during the lapse until an appropriation is enacted. Additional information on severance pay (including eligibility criteria and payment formulas) can be found at http://www.opm.gov/oca/pay/HTML/severance_pay.asp. Q. How is Continuation of Pay (COP) under the Federal Employees' Compensation Act affected by a Government shutdown? A. The Department of Labor’s Office of Workers' Compensation Programs which administers the Federal Employees' Compensation Act (FECA) advises that, in the event of a Government shutdown, an employee who is disabled due to his or her injury is to be maintained in COP status during the shutdown unless the agency does not have monies available to pay the salary of that employee. If the agency does not have monies to pay salary during the shutdown but the agency’s budget is subsequently restored in such a way as to allow for retroactive payment of salary during the shutdown period, the employee should receive COP for any period of disability that occurs within the shutdown. In the event an agency is legally unable to pay COP to an employee because of a lapse in appropriations, the employee may file a claim for regular FECA wage loss compensation for that period. Q. What is the effect of a shutdown furlough on Thrift Savings Plan (TSP) contributions, investments, and loans? Q. Can an employee obtain a loan from his/her TSP account based on anticipated financial hardship resulting from the furlough? A. Agencies and employees should refer to the TSP website or contact their agency representative for information. Agency representatives may contact the Federal Retirement Thrift Investment Board at (202) 942-1450 for additional information. Q. Can I make contributions to my TSP account while I am in nonpay status (i.e., furlough)? A. No. Because employee contributions to TSP accounts must be made as deductions from payroll, you cannot contribute to your TSP account while you are in non-pay status for one or more full pay periods. Q. If I am a FERS/FSPS participant, will I receive the government’s automatic (1%) and matching contributions to my TSP account while I am in non-pay status? A. No. Agency automatic (1%) contributions are calculated on basic pay earned during each pay period, and Agency matching contributions are calculated based on employee contributions from that basic pay. Therefore, if you are in non-pay status and do not earn basic pay for a particular pay period, you will not receive either type of Agency contribution for that pay period. These contributions are lost unless Congress takes action to restore pay. Q. I am in non-pay status and have a TSP loan that I am repaying through payroll deductions. I am concerned about missing loan repayments. What should I do? A. You should either make payments directly to TSP or make arrangements with TSP to suspend your loan repayments. TSPFS4 - Effect of Nonpay Status on Your TSP Account (Fact Sheet) provides additional information and can be downloaded from tsp.gov. Q. I changed my health care plan during open season. Will my new health insurance take effect as expected during the furlough? A. It depends on whether your application was processed before the furlough. If you’ve received a new ID card, your enrollment was processed. See section H in OPM’s furlough guidance for specifics here: https://www.opm.gov/policy-data-oversight/pay-leave/furloughguidance/gui... You may also check with your new carrier to confirm your new enrollment. Q. Will W-2 forms be issued during the shutdown? A. Yes, the Wage and Tax Statement (W-2) will be issued during the shutdown as scheduled. It will be printed and mailed to the residence address of record for each employee receiving wages by NFC during the 2018 calendar year. W-2s will be both mailed and posted in the Employee Personal Page (EPP) by January 31, 2019. Q: Are “excepted”/”exempted” employees allowed to engage with the press, post on social media, or pursue other outward facing public engagements? A. Chiefs of Mission & Assistant Administrators can determine whether public events, media engagements, social media, etc. constitute "excepted" functions and whether they should proceed or not. If you have questions about what is an “excepted” activity, please reach out to GC or your RLO. Q. How should representation events be handled during a furlough? A. As a general rule, no representation events should be held during the shutdown period. Events already scheduled should be cancelled and no new events planned until the shutdown is over. In exceptional cases, Mission Directors, in coordination with the Chief of Mission, may authorize a representational event overseas only if it is necessary to support “excepted” activities. Mission Directors should consider the perception of a representational event during an Agency shutdown. Q. What if an employee is invited to an official outside event? May they attend? A. If on “excepted” status, you may attend if the event is consistent with your “excepted” duties. Q. I have been invited to be a speaker at a public function, can I still attend? A. If on excepted status, only on an exception basis. Contact the Bureau for Legislative and Public Affairs (LPA). No speeches to public audiences may be made during the shutdown period without explicit approval from the SDAA/LPA. Q. What will happen to credit unions, dry cleaners, snack bars, and other commercial facilities located in Federal buildings if the government shuts down? A. Most Federal facilities, owned and leased, will remain open to accommodate some level of “excepted” services and as long as there are people in a building certain services must be provided, such as security, heating/cooling, electricity, and the like. The services may be at reduced levels. This will allow commercial facilities to operate, but some may choose not to do so for economic reasons. If you plan on making use of such an establishment during the possible lapse, check beforehand to make sure it will be operating, and on what conditions. Q. If I am a “furloughed” employee, may I access my office building during the shutdown? A. Yes, but only for personal purposes such as going to the bank. “Furloughed” employees may not do any work-related activities while on the premises. Q. Will shuttle buses be running between the Ronald Reagan Building, SA-44, 2PY, 1717 Pennsylvania Ave., or the Washington Learning Center? A. Any changes to shuttle bus schedules will be posted at https://pages.usaid.gov/M/MS/HMD/shuttle-services. Q. What if I have questions about Military Duty (including reserve duty)? 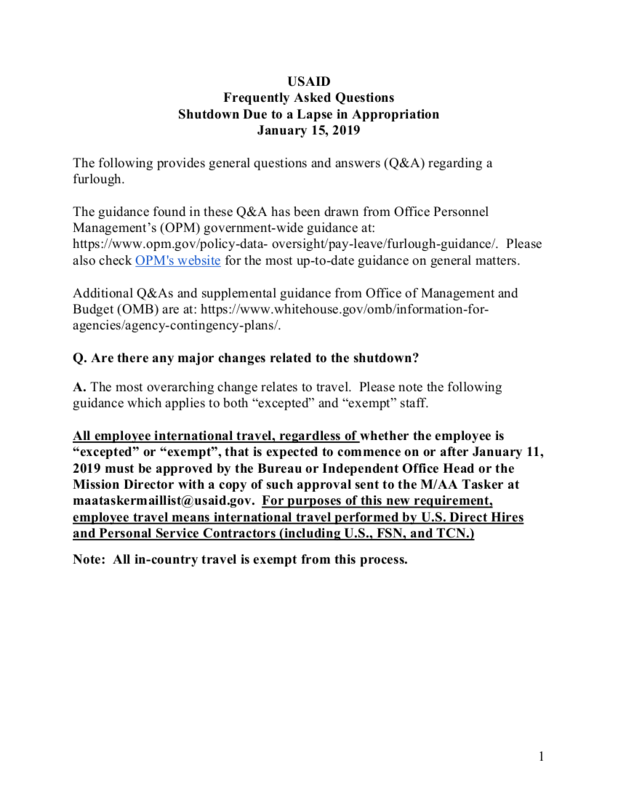 Employees are requested to direct other furlough questions to their bureau administrative officers or the shutdown_info@usaid.gov mailbox.